Christmas is the most wonderful time of the year, where families make it a point to spend the holidays together, exchange presents and, of course, bond over a sumptuous meal. But if you’ve had the experience of preparing a full feast, you’d know well all the hard work, time and effort needed to craft the most beautiful experience. This year, why not leave it to the experts and focus instead on spending more time with your loved ones? Executive chef Eric Cheam and team are willing to take on this task for you. 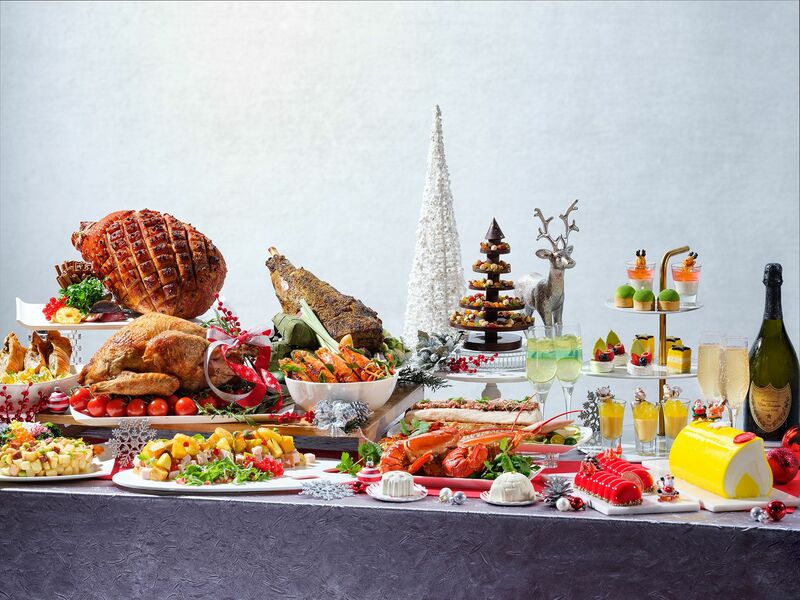 In fact, they’ve crafted a host of mouth-watering festive takeaways should you decide to bring the party home. What’s a holiday spread without turkey? This year’s rendition, the ayam siow roasted turkey, features the bird marinated in homemade coriander tamarind sauce for 36 hours; this ensures all the goodness is infused down to the core before it’s slow roasted to achieve a crisp skin and succulent meat. Even better, it comes with fragrant nasi goreng stuffing, sautéed brussels sprouts with green chilli and roasted masala potato. Now that the turkey is settled, toss in more savoury delights that include the maple-glazed bone-in cola gammon ham, roasted Australian grass-fed ribeye and baked salmon mushroom duxelle en croute. And for that grand finale, the matcha azuki logcake is the perfect mélange of sweet and indulgent matcha sponge, red bean jelly and matcha mascarpone cheese. For those who’d like to dine out—perhaps on Christmas Day or New Year’s eve—chef Cheam has upped the glorious spread at The Dining Room for a truly memorable dining experience. He added local nuances to familiar favourites such as the ayam siow roasted turkey; roasted leg of lamb paired with nutty satay sauce; creamy salted egg lobster pasta and fried chicken wings with a rojak dressing. Now, if you want to change things up a bit, have a Cantonese-inspired Christmas meal at Li Bai Cantonese Restaurant. What you’ll get are two five-course curated menus that showcase its lipsmacking signatures—from the quintessential braised bird’s nest with crab meat and roe, to the comfortingly good double-boiled chicken soup with fish maw and matsutake mushrooms served in a young coconut, and noodles with baked Boston lobster. And for one last hurrah, before you welcome a brand new year, treat the whole brood to a luxurious staycation at Sheraton Towers Singapore. Stay in the elegantly appointed rooms (with complimentary wifi access) and wake up to a sumptuous breakfast at The Dining Room, as well as a surprise Christmas treat. Isn't that a Christmas worth remembering? The festive takeaways are available at the hotel’s Christmas booth from December 1 to 25, from 11am to 9pm. An advanced order of two days is required. For orders and enquiries, please call 6839 5636/5621 or email thediningroom@sheratonsingapore.com. The festive lunch and dinner buffet at The Dining Room is available from December 10 to 25, and December 31 and January 1, 2019. For reservations and enquiries, please call 6839 5621 or email thediningroom@sheratonsingapore.com. The festive menu at Li Bai Cantonese Restaurant is available on December 24 and 25, and December 31 and January 1, 2019. For reservations and enquiries, please call 6839 5623 or email libai@sheratonsingapore.com. The festive retreat package is available from December 7 to 30. For reservations and enquiries, please call 6839 5755 or email reservations@sheratonsingapore.com.